The scene from New Zealand isn’t that known in our countries, and that’s a pity for there seems to be quite a vivid and interesting scene out there. 8 Foot Saliva, Ulcerate, Dawn Of Azazel and maybe a (child’s) hand full of others; everybody knows these, but there are plenty of superb bands and projects dwelling at the other side of Mater Terra (down under and then to the right…). Such a revelation is a band presented to us via Belgian label Immortal Frost. Apnea are an act from Auckland, New Zealand, that was formed in 2011 by Drew Reid (all instruments, vocals, lyrics), joined shortly after by Ben Mikkelsen (guitars). The duo recorded an EP, called Silent Cities, which is the sole official release Apnea have until now. I guess they are working on new stuff (at least, I hope so), because the duo recruited new members in mean time (also helpful to play live, of course): drummer Corey Friedlander (you might know him from 8 Foot saliva or from his former activities in In Dread Response) and vocalist Sean O’Kane Connolly (active in lots of solo-projects like Taur Nu Fuin or Gaoth Anair, yet also formerly involved with In Dread Response). 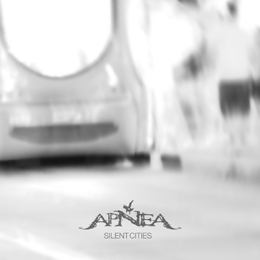 Anyway, Silent Cities, recorded by Apnea when still being a duo, has a total running time of twenty three minutes. And it is a pretty organic mini-album, despite a pronounced Post-attitude. With this recording, Apnea sort of profiles a mixture in between raging Black Metal and subtle Post-Rock / Metal, with quite some variation in tempo (from very slow to blasting fast). Extreme (meaning: furiously fast and aggressive) parts interact with soft (read: slower, integer, and sometimes even emotive) pieces (with acoustic passages), but with a cohesion that defines a self-identifying character, courtesy of Apnea only. Most tracks (Mediums and She Is) are mixing that specific Black-oriented form of aggression with some more introspective parts, but some pieces, like the instrumental song Mibi, have the album injected by rather Post-Rock oriented forms of aural integrity. Also last song Sve is rather ambient-emotive, nicely contrasting to the blackish fury of the main parts on Silent Cities. And with Sleeping Horses, for example, you have a clear mixture of both furious Black Metal and integer Post-Rock, injected by hints of Ambient and Shoegaze.